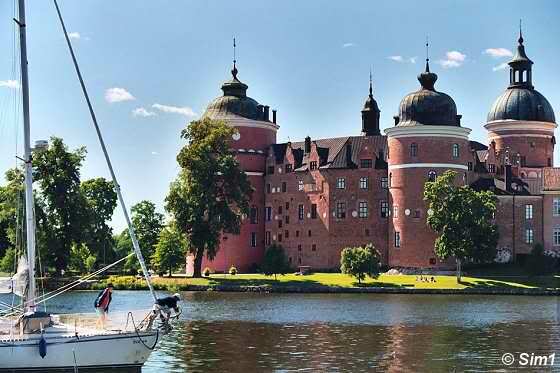 Gripsholm castle is beautifully situated on the shores of Lake Mälaren, next to the village of Mariefred. This is actually not the first castle that was built here. The first castle was built in the second half of the 14th century by Bo Johnsson Grip. And this name also explains part of the name of the castle : Gripsholm. The second part of the name "Holm" means "island", so it actually means Island of Grip. 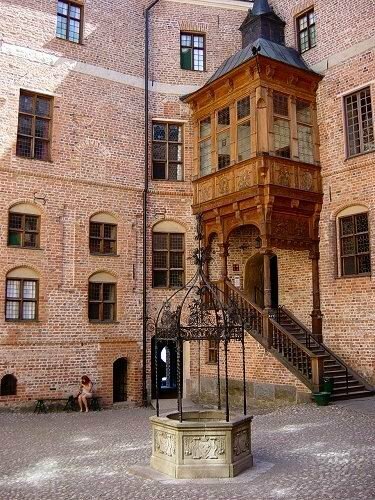 The castle of Gripsholm is one of the Royal castles in Sweden. 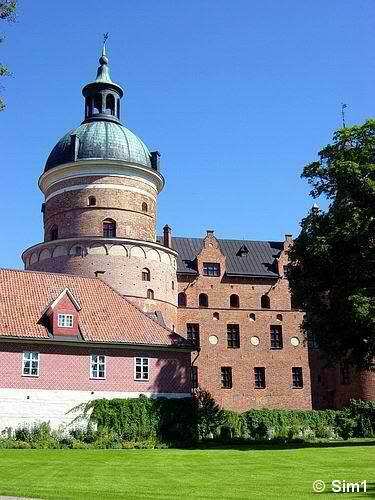 This castle started to be build by King Gustav Vasa in 1537 as part of a new system of national defences. 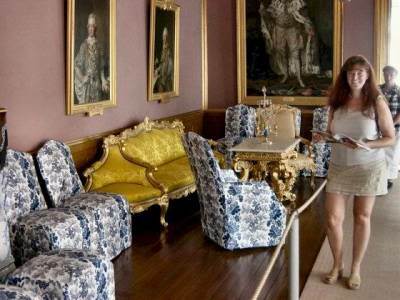 In the castle you can see a lot of Swedish interior design from the 16th to the late 19th century. But the main thing the castle is known for is its great collection of portraits : the Swedish national collection. The number of portraits is huge (the collection has over 4,000 pictures), and it features prominent Swedes from the days of Gustav Vasa until now. Hahaha, you have to know some famous Swedes of course to really appreciate it. But there are a few names that you might know, like Ingrid Bergman and Greta Garbo. Like a lot of castles, Gripsholm has been altered and added to several times since they first began to build the castle. There are some fun details you can notice of these additions and changes when you look at the castle. A fun detail of the castle gets visable when you click on the picture. The building on the left side is of a lighter and brighter colour than the rest of the castle and that is due to that the bricks are not real, but painted on as a pattern. They wanted to make the castle look like it was of all brick, and decided to paint the pattern of stones on the walls. It looks great when you look at the castle from a distance; it really looks like a 100% brick castle. But when you come closer you will notice that it is just a painted on decoration, instead of the original brick. Hahaha, I am still not sure if I like it, but it is a fun detail to watch. Inside the castle, at the part where the 'members of the court' lived, you can see some alterations. The 'court' got so big that they didn't have enough rooms in the castle to house all the people. It was of course a great honour to live in the castle, so that's where all the members of the court wanted to be. To solve this problem in this area of the castle, the ceilings of the rooms were lowered and an extra floor was created to give the members of the court more space to live. Hahaha, the fun thing to see though is that the windows have stayed the same, resulting that some windows are at weird heights in the room, and sometimes split between the two floors. When you visit Gripsholm castle it is nice to take a look at the gardens first and walk around the castle, instead of going inside the castle right away. The castle is situated at Lake Mälaren, and the gardens around the castle are small but nice. It's great to walk here on a nice summers day, watching the views on the castle, the lake, the picturesque village of Mariefred, and of course the beautiful flowers in the garden. The inside of the castle is huge! I sometimes had the idea I was lost inside the castle with its many rooms and corridors. 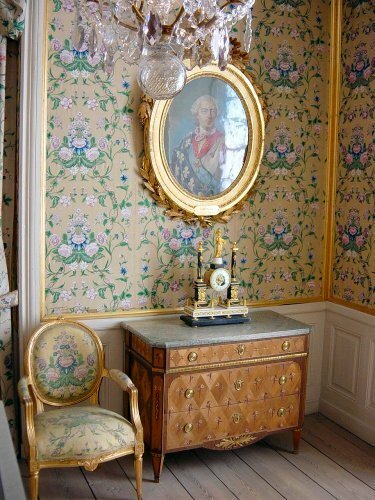 Many of the rooms are decorated in the original style, like this room, the princess's bedchamber. The interior decorations in this particular room have remained virtually untouched since 1782. The painted Chinese silken wall-hangings, have faded considerably though. I wonder how bright and colourful it must have looked originally, it must have been fantastic. The clock you can see is from about 1800 and the chest of drawers was made in about 1780. 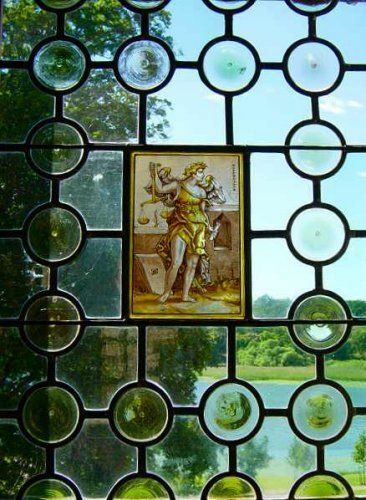 This is one of the beautiful windows in the throne room. The throne room is the biggest room in the Castle and was probably completed during the 1590's. Now it is used as a concert room, with a big piano where I think the throne used to be. This does take away the feeling of the original room, but it is still nice to look at some of the details in this room. The theatre in Gripsholm castle is really impressive. I think it is the room in the castle that made the most impression on me. It was build by Gustav III in the 1780's in the old Church tower, now known as the theatre tower. Gustav III loved theatre and that really shows. The architecture of this room is fantastic and it has made the most use of the space. The theatre is one of the best-preserved 18th century theatres in Europe. 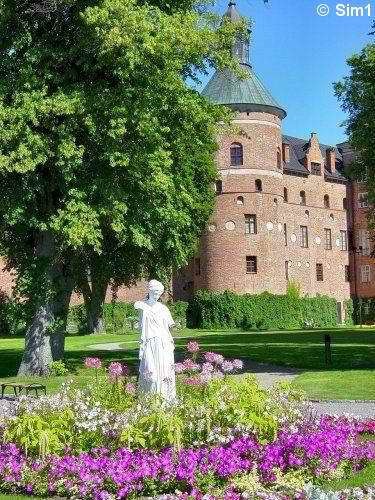 King Gustav loved the theatre so much that he was a regular actor in one of the plays performed at Gripsholm Castle. I wish I could show you a picture of the theatre itself, but it wasn't possible to take any pictures there. So instead a picture of the back of the theatre. In this room you can see the mechanism to change the decors in the theatre during the plays. This picture was taken in the Upper Armoury. 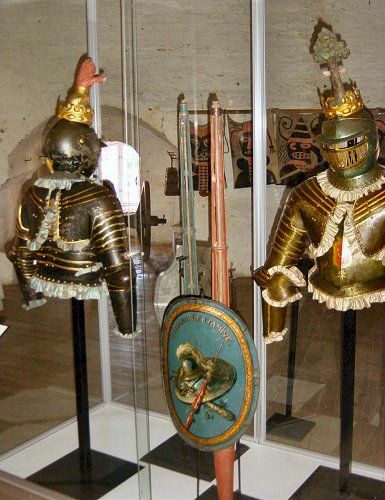 In this room you can see the suits of armour used in the carousels and tournaments of Gustav III. The room is decorated with wolf nets and flags on the walls, which were still being used in the 19th century for local wolf hunts. Besides this you can also see a stuffed lion in the room. This lion was given in 1732 by the Bey of Algiers to Frederik I. There are daily guided tours in Swedish for the general public. Guided tour in English at 13.00 between May 15th and September 15th. The charge for public guided tours is SEK 10 per person over and above the admission charge. 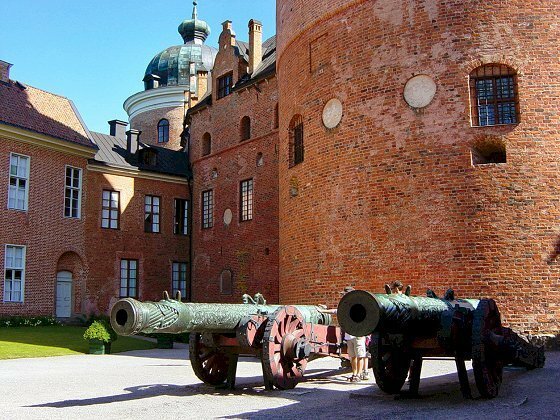 These are the two Russian cannons you can see in the courtyard of Gripsholm castle. The bigger cannon was cast in 1579 and the smaller one in 1577. The cannons are quite big, and they are actually much larger than most cannons of that time. 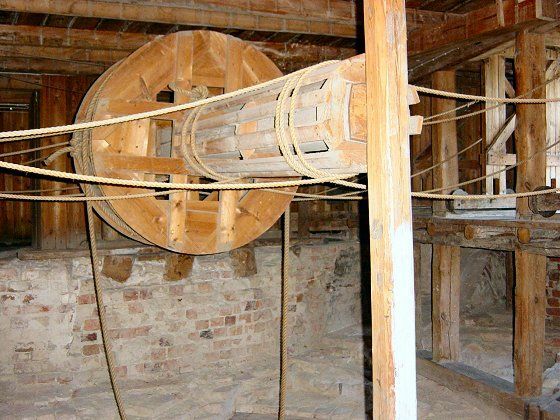 Both cannons were captured during the war and dragged back to Gripsholm Castle in 1623. Originally both cannons were called 'The Wulf'. One of them, they don't know which, was taken at Narva in 1581and the other at Ivangorod in 1612. 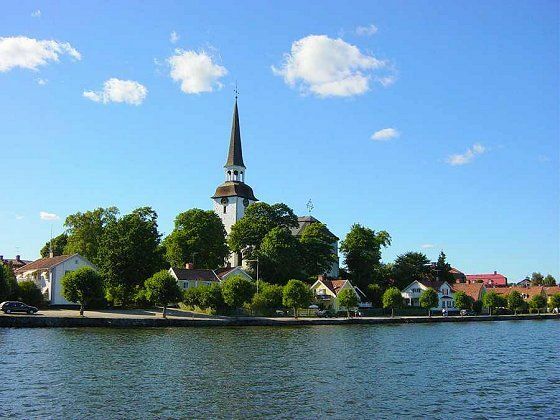 When you visit Gripsholm Castle, you musn't forget to visit the village of Mariefred as well. There is nothing really spectacular to see, but it's such a lovely quiet and picturesque village. I just loved the atmoshpere of this little town. There are a few attractions though in Mariefred that you might like to see. There is a steamtrain and a little museum at the old trainstation of Mariefred. The steamtrain is still running these days for the tourists.